Call us to reserve your next fishing charter trip. Swordfish boat limit increased. Charter boat limit is now 6. Are you planning on visiting the Daytona Beach area? If so you, need to make time for a private fishing charter trip. The Daytuna is a 43 foot Tourist Sport Fisher anchored at Critter fleet in Ponce Inlet, Florida. 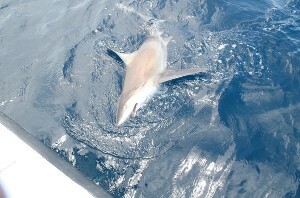 Our fishing charter trips are 4-12 hours, with one of the most experienced captains in Eastern Florida. Captain Bob has over 55 years of fishing experience in the area, he knows where some of the best fishing sites are located. We offer offshore & inshore charters, from light tackel to sport fishing, bottom fishing to flats fishing. When you charter with Daytuna Fishing Charters Inc. you get the best fishing experience in Central Florida. All trips include rod, reel, bait tackle and license. There are 3 fighting chairs on the boat. You can expect to catch a wide variety of reef fish, grouper, snapper, sea bass, trigger fish and more. Your first mate is available for fish cleaning services for a small fee. You can bring coolers with food and drinks on board. The Daytuna can hold up to 6 people. Advanced reservations are welcomed but not necessary. Some may need to be canceled due to poor weather conditions. We will take you out for the best deep sea adventure around.